Pull up to the front of your cottage and witness the ocean just 75 steps away! Relax on the private, sandy beach (adjacent to Campground Beach). The warm waters of Cape Cod Bay in North Eastham are enjoyed by all ages! If you need to be close to the beach, this is where your Cape Cod family memories begin! Recently remodeled with many new Cape-style furnishings and fixtures that will add great comfort to your stay, including expanded master bedroom and second bedroom as well as an all new bathroom! The master bedroom comes furnished with a queen bed and the second bedroom has two twin beds making for comfortable sleeping quarters for four. Sink into the reclining chair in the main room to watch your favorite TV show or ballgame. The pull-out sleeper in the main room offers additional options depending upon the make-up of your group. Enjoy our private and peaceful yard with flower gardens while cooking your favorite summertime recipes on the gas grill. Share your meals in our most popular feature, the screened-in porch, or at the over-sized outdoor picnic table. Then, after a stroll on the beach, take in the salt air of a warm summer evening while kicking back on a lounge chair on the deck, but don't forget to save time for the spectacular sunsets! Relax in the private, cedar, outdoor shower with hot water and a changing area. This is a must for anyone who appreciates showering under the sun or stars! 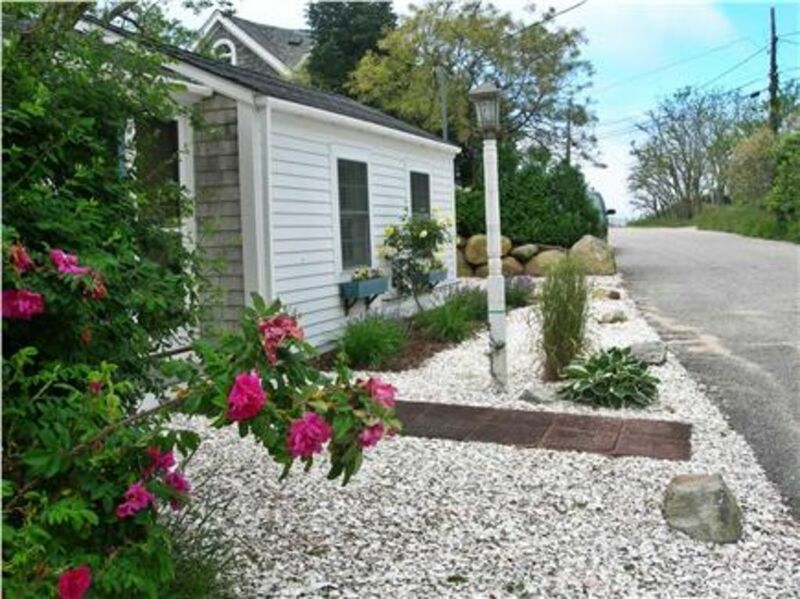 House rental amenities: Everything you need for your Cape Cod Vacation: air conditioning, full kitchen, blankets, pillows, cable TV, wireless internet and DVD. Renter to supply bed sheets and towels. Linens available at an additional cost of $30 per person. **Short term rental tax of 12.45% will be added to all reservations that begin after July 1, 2019. Included are private parking spaces for two cars. Kites, floats and beach toys are available in the shed. Gateway to the Cape Cod National Seashore, the Town of Eastham is a coastal resort community straddling the arm of Cape Cod. Located on the outer Cape, the town is bounded on two sides by land, the other two by water, the Atlantic Ocean and Cape Cod Bay. Eastham is a quiet town with several ocean and bay beaches, a host of kettle ponds, pretty country lanes, panoramic views of Cape Cod Bay and the Atlantic Ocean, and lots of wide-open space for nature lovers. The Audubon Sanctuary in Wellfleet is a popular spot and is only several miles away. *Multiple families wishing to vacation together, please contact us for additional local cottage recommendations. We have vacationed with our kids in Eastham for over twenty five years. It has always been our dream to own a home that we can share with others to create memories like the ones that we have enjoyed for so long. Eastham is an area for all ages and interests. It goes beyond the beautiful beaches and water sports to include sightseeing of American Indian and Pilgrim settlements, whale watching, nature trails, vineyard tours and natural history. The proximity of this cottage to the beach is commented on consistently by our guests. Being just a one minute walk away allows you to make easy trips back and forth whenever you need to, be it a cold drink, a bathroom visit or a change of clothes. The property itself offers a private backyard for relaxing after a day at the beach or when cooking out. Our most popular feature at the cottage is the fabulous outdoor shower. Don't forget to try showering under the stars! However, before you do that, you'll want to walk those few steps back to the beach to watch the sun setting into the ocean on a clear day. This is an east coast rarity and one that never grows old - even after twenty five years! Proximity to Campground Beach and our private beach Screened porch with custom plexi-glass panels that are installed during cooler off-season months makes the porch comfortable for use right through the entire off-season. Colorful garden views from the porch. Walking out the front door and seeing the ocean as well as hearing it on an angry ocean night! Shower/no tub. Also large outdoor cedar hot water shower with changing area. A peak from the kitchen window. Better view of the bay from in front of the cottage. Fully stocked kitchen. Ask owner if there is a particular item that you are in need of. Flat screen/High definition. Cable package includes sporting events. High definition with expanded cable package. Sound bar for improved sound. Worth every penny!! A slice of old Cape Cod!! Great location! This cottage is so close to the beach, we’ll equipped with everything you need and a fantastic place to unwind in the evening! Our family of four couldn’t think of one thing that we longed fior. The owners were great to work with and even provided an Alexa that we used for listening to music, weather and news! Can’t wait to return next summer! This cottage has our heart. We have stayed there for many years and have many happy memories there. Charles and Paula are wonderful and have captured the simplicity of the beach cottage beautifully! I would highly recommend this cottage! Thank you Christine. Your heart-felt comments about your memories in our guest book at the cottage should be read by all of our guests. Recreating those old memories and allowing an opportunity for others to create new ones is a big part of why we do what we do in Eastham. Thank you for sharing. Our family of four had a wonderful stay at this cottage. It was steps from the beach on the bay, and Eastham is a great location for exploring the Cape. The cottage itself was tastefully decorated and perfectly clean. It had everything you could want from an outdoor shower and a screened porch to fast Wi-Fi and A/C, which we didn't really need given the fans and the good air circulation. We would definitely stay here again. Thanks Charles and Paula! Thank you Katherine. We do our best to create a comfortable stay for everyone who stays at our cottage and it sounds like we can add you to the list! Thank you for coming and enjoying a little piece of our heaven in Eastham. This is our second summer staying at Paula and Charles' special cottage! Our seven year olds love the bay beach steps away, whether it was to toss around a football or to search for crabs. This year they added a fantastic new grill and two cozy cushioned chairs on the wonderful porch. The place is always spotless and the owners always check in with suggestions of things to do or places to visit. The week flew by and we were sad to pack up and leave this peaceful place. Thanks again Charles and Paula for a great place for our family to enjoy our summer vacation! We will be back again! Thank you Melissa and Jim! Each year we try to make improvements to enhance the experience. The chairs were Paula's idea and the grill was mine! Hope that you were able to fit all of the activities in. We understand that sometimes the beach and relaxing can get in the way. There's always next year! This is a great cottage to book along with Campground C if you want to have two families close to each other! Thanks again Karla! The cottage set up is perfect for people who want to b together, but might also need their space. My husband and I were looking for a quiet few days after a hectic winter and the cottage was the perfect respite. The cottage is a quick walk to Campground Beach. The location is serene but not far from restaurants, and surrounding towns. Lovely stay. Thank you Joni! The off season is the perfect time to come relax after a New England winter. The nearby restaurants might close on the early side, but at least waiting for a table is a rarity! We look forward to having you come back again! Eastham and the surrounding towns are enjoyed by beach-goers, swimmers, surfers and general outdoor enthusiasts who like to bike and hike the local trails in and around the Cape Cod National Seashore. There are many local restaurants to choose from as well. Day trips to Martha's Vineyard and Nantucket can be taken on the ferry just 20 minutes away. Whale watches are also popular and there are boats from Provincetown most of the year. Rates are subject to change until reservation is confirmed.Massachusetts Lodging tax is 12.45% for reservations that begin after July 1, 2019. If your booking is for prior to July 1, 2019 and you are charged tax by the web site, then your tax will be refunded by the owner.